He died on 28 October 1918. He was 32. He was the son of Richard and Helen Gibbard of Ardley. He died on 22 November 1918. He was 29. He was the son of Thomas and Elizabeth H May of Baynard's Green. His brother William Clarence May also fell. Second Lieutenant, 1st/5th Battalion, The Northumberland Fusiliers, 149 Brigade, 50th Division. He was the son of Thomas and Elizabeth H May of Baynard's Green. His brother Howard Stanley May also fell. He is buried in plot IV row D grave 16 Peronne Road Cemetery, Maricourt, Somme. He is buried in grave VII B 2 Hotton War Cemetery, Luxembourg. He was the husband of Daisy Hollis of Cowley. Almost all of the 52 WW2 burials in the extension date from May 1940 and the withdrawal of the British Expeditionary Force ahead of the German advance. 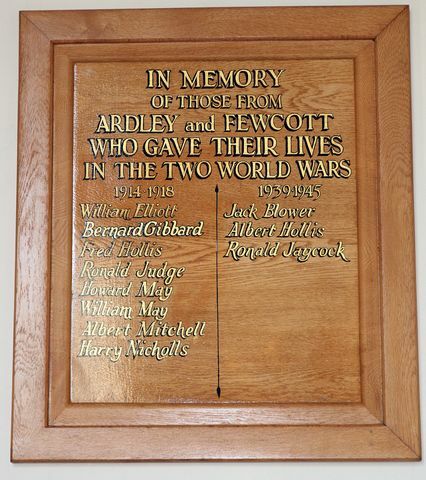 He was the son of Charles Henry and Hannah Judge of Ardley and the husband of Ethel Florence Allsopp (formerly Judge), Brendon House, 149 Windmill Road, Headington.